Native to South America, peanuts are now grown throughout the world and make up a staple in the average American diet. Most peanut products feature roasted peanuts, which have a richer flavor than raw peanuts, but raw varieties are available at bulk stores, health food stores and some grocery stores. Raw peanuts' rich nutritional profile supports tissue health, and some of the nutrients found in peanuts can even fight disease. Raw peanuts provide beneficial fiber and protein. Not only do these nutrients keep you feeling full for longer after your meal, but they also offer a variety of other health benefits. Protein supports your immune system, and provides amino acids needed for tissue growth and maintenance. Fiber helps regulate your blood sugar and lowers your cholesterol, and consuming fiber-rich foods reduces your risk of type 2 diabetes and cardiovascular disease. Each 1-ounce serving of raw peanuts has 7.3 grams of protein and 2.4 grams of fiber -- 10 percent of the fiber intake recommended for women and 6 percent for men, according to the Institute of Medicine. Raw peanuts are also healthful additions to your diet thanks to their magnesium and copper content. Copper plays a role in immune system function and also nourishes and strengthens your bones, while magnesium promotes health muscle function and helps your cells produce energy. 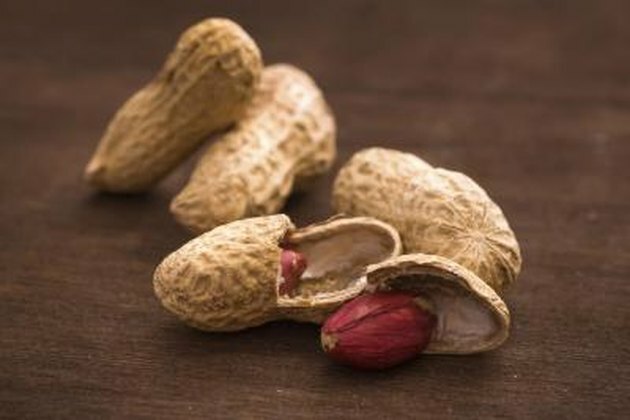 Each ounce of raw peanuts provides 48 milligrams of magnesium -- 11 percent of the recommended daily intake for men and 15 percent for women -- and 324 micrograms of copper, or 36 percent of your recommended daily intake, according to the Institute of Medicine. Opting for raw peanuts ensures that you'll consume a significant amount of both minerals -- oil-roasted peanuts contain just 151 micrograms of copper. Raw peanuts serve as an excellent source of vitamin E and folate, or vitamin B-9. Both of these vitamins play potential roles in disease prevention -- vitamin E fights free radicals, which would otherwise contribute to cancer, while folate lowers your homocysteine levels -- high homocysteine is associated with cardiovascular disease. Vitamin E also boosts red blood cell development, and folate supports new cell growth. Each serving of raw peanuts provides you with 2.4 milligrams of vitamin E and 68 micrograms of folate. This contributes 16 percent toward your daily vitamin E intake and 17 percent toward your daily recommended intake of folate, according to the Institute of Medicine. Oil-roasted peanuts, in contrast, contain just 34 micrograms of folate and 2 milligrams of vitamin E.
Enjoy raw peanuts on their own as a snack, or add them to your favorite recipes. A handful of raw peanuts adds crunch to leafy green salads, and also works well in grain salads -- try a mixture of quinoa, shredded carrot, sesame seeds, chopped raw peanuts and a toasted sesame oil vinaigrette for a hearty side dish or lunch option. Alternatively, use chopped peanuts to garnish your favorite soups, or grind them in a food processor for all-natural, raw peanut butter.